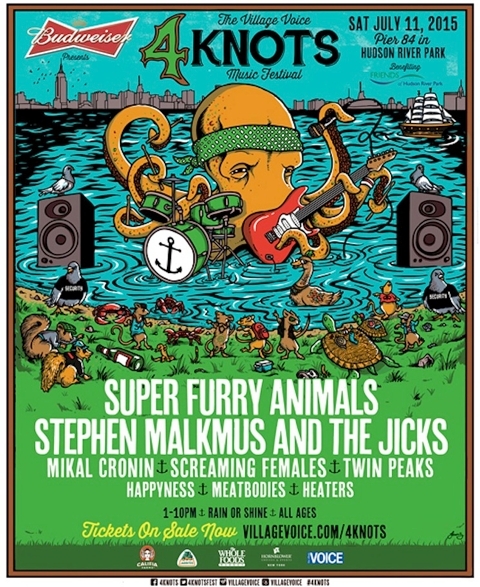 Anti-Pitchfork: Stephen Malkmus & the Jicks and Screaming Females added to 2015 4Knots Festival with Super Furry Animals! Stephen Malkmus & the Jicks and Screaming Females added to 2015 4Knots Festival with Super Furry Animals! The lineup for the 2015 4Knots Festival has expanded once again. In addition to headliners Super Furry Animals, we'll also now get another '90s indie great, Stephen Malkmus and his band the Jicks, providing direct support. Also added are the shredding NJ punk trio Screaming Females. Those additions join Mikal Cronin, Twin Peaks and more. This year's fest happens July 11 on Hudson River Park's Pier 84. Tickets are still available.